MySQL (/ˌmaɪˌɛsˌkjuːˈɛl/ "My S-Q-L") is an open-source relational database management system (RDBMS). Its name is a combination of "My", the name of co-founder Michael Widenius's daughter, and "SQL", the abbreviation for Structured Query Language. MySQL is free and open-source software under the terms of the GNU General Public License, and is also available under a variety of proprietary licenses. MySQL was owned and sponsored by the Swedish company MySQL AB, which was bought by Sun Microsystems (now Oracle Corporation). In 2010, when Oracle acquired Sun, Widenius forked the open-source MySQL project to create MariaDB. MySQL is a component of the LAMP web application software stack (and others), which is an acronym for Linux, Apache, MySQL, Perl/PHP/Python. MySQL is used by many database-driven web applications, including Drupal, Joomla, phpBB, and WordPress. MySQL is also used by many popular websites, including Facebook, Twitter, Flickr, and YouTube. MySQL is written in C and C++. Its SQL parser is written in yacc, but it uses a home-brewed lexical analyzer. MySQL works on many system platforms, including AIX, BSDi, FreeBSD, HP-UX, eComStation, i5/OS, IRIX, Linux, macOS, Microsoft Windows, NetBSD, Novell NetWare, OpenBSD, OpenSolaris, OS/2 Warp, QNX, Oracle Solaris, Symbian, SunOS, SCO OpenServer, SCO UnixWare, Sanos and Tru64. A port of MySQL to OpenVMS also exists. The MySQL server software itself and the client libraries use dual-licensing distribution. They are offered under GPL version 2, or a proprietary license. Support can be obtained from the official manual. Free support additionally is available in different IRC channels and forums. Oracle offers paid support via its MySQL Enterprise products. They differ in the scope of services and in price. Additionally, a number of third party organisations exist to provide support and services, including MariaDB and Percona. MySQL has received positive reviews, and reviewers noticed it "performs extremely well in the average case" and that the "developer interfaces are there, and the documentation (not to mention feedback in the real world via Web sites and the like) is very, very good". It has also been tested to be a "fast, stable and true multi-user, multi-threaded sql database server". Version 4.0: beta from August 2002, production release March 2003 (unions). Version 4.1: beta from June 2004, production release October 2004 (R-trees and B-trees, subqueries, prepared statements). Version 5.0: beta from March 2005, production release October 2005 (cursors, stored procedures, triggers, views, XA transactions). The developer of the Federated Storage Engine states that "The Federated Storage Engine is a proof-of-concept storage engine", but the main distributions of MySQL version 5.0 included it and turned it on by default. Documentation of some of the short-comings appears in "MySQL Federated Tables: The Missing Manual". Sun Microsystems acquired MySQL AB in 2008. Version 5.1 contained 20 known crashing and wrong result bugs in addition to the 35 present in version 5.0 (almost all fixed as of release 5.1.51). MySQL 5.1 and 6.0-alpha showed poor performance when used for data warehousing – partly due to its inability to utilize multiple CPU cores for processing a single query. Oracle acquired Sun Microsystems on 27 January 2010. The day Oracle announced the purchase of Sun, Michael "Monty" Widenius forked MySQL, launching MariaDB, and took a swath of MySQL developers with him. The default storage engine is InnoDB, which supports transactions and referential integrity constraints. SIGNAL and RESIGNAL statement in compliance with the SQL standard. Support for supplementary Unicode character sets utf16, utf32, and utf8mb4. New options for user-defined partitioning. MySQL Server 6.0.11-alpha was announced on 22 May 2009 as the last release of the 6.0 line. Future MySQL Server development uses a New Release Model. Features developed for 6.0 are being incorporated into future releases. The general availability of MySQL 5.6 was announced in February 2013. New features included performance improvements to the query optimizer, higher transactional throughput in InnoDB, new NoSQL-style memcached APIs, improvements to partitioning for querying and managing very large tables, TIMESTAMP column type that correctly stores milliseconds, improvements to replication, and better performance monitoring by expanding the data available through the PERFORMANCE_SCHEMA. The InnoDB storage engine also included support for full-text search and improved group commit performance. The general availability of MySQL 5.7 was announced in October 2015. As of MySQL 5.7.8, August 2015, MySQL supports a native JSON data type defined by RFC 7159. MySQL Server 8.0 was announced in April 2018, including NoSQL Document Store, atomic and crash safe DDL sentences and JSON Extended syntax, new functions, such as JSON table functions, improved sorting, and partial updates. Previous MySQL Server 8.0.0-dmr (Milestone Release) was announced 12 September 2016. Work on version 6 stopped after the Sun Microsystems acquisition. The MySQL Cluster product uses version 7. The decision was made to jump to version 8 as the next major version number. 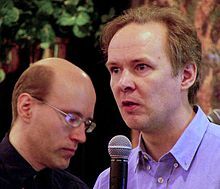 On 15 June 2001, NuSphere sued MySQL AB, TcX DataKonsult AB and its original authors Michael ("Monty") Widenius and David Axmark in U.S District Court in Boston for "breach of contract, tortious interference with third party contracts and relationships and unfair competition". In 2002, MySQL AB sued Progress NuSphere for copyright and trademark infringement in United States district court. NuSphere had allegedly violated MySQL AB's copyright by linking MySQL's GPL'ed code with NuSphere Gemini table without being in compliance with the license. After a preliminary hearing before Judge Patti Saris on 27 February 2002, the parties entered settlement talks and eventually settled. After the hearing, FSF commented that "Judge Saris made clear that she sees the GNU GPL to be an enforceable and binding license." In October 2005, Oracle Corporation acquired Innobase OY, the Finnish company that developed the third-party InnoDB storage engine that allows MySQL to provide such functionality as transactions and foreign keys. After the acquisition, an Oracle press release mentioned that the contracts that make the company's software available to MySQL AB would be due for renewal (and presumably renegotiation) some time in 2006. During the MySQL Users Conference in April 2006, MySQL AB issued a press release that confirmed that MySQL AB and Innobase OY agreed to a "multi-year" extension of their licensing agreement. In February 2006, Oracle Corporation acquired Sleepycat Software, makers of the Berkeley DB, a database engine providing the basis for another MySQL storage engine. This had little effect, as Berkeley DB was not widely used, and was dropped (due to lack of use) in MySQL 5.1.12, a pre-GA release of MySQL 5.1 released in October 2006. In January 2008, Sun Microsystems bought MySQL AB for $1 billion. In April 2009, Oracle Corporation entered into an agreement to purchase Sun Microsystems, then owners of MySQL copyright and trademark. Sun's board of directors unanimously approved the deal. It was also approved by Sun's shareholders, and by the U.S. government on 20 August 2009. On 14 December 2009, Oracle pledged to continue to enhance MySQL as it had done for the previous four years. 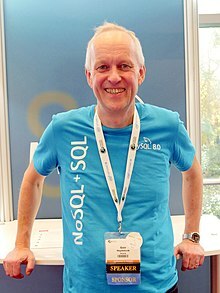 A movement against Oracle's acquisition of MySQL AB, to "Save MySQL" from Oracle was started by one of the MySQL AB founders, Monty Widenius. The petition of 50,000+ developers and users called upon the European Commission to block approval of the acquisition. At the same time, some Free Software opinion leaders (including Pamela Jones of Groklaw, Jan Wildeboer and Carlo Piana, who also acted as co-counsel in the merger regulation procedure) advocated for the unconditional approval of the merger. As part of the negotiations with the European Commission, Oracle committed that MySQL server will continue until at least 2015 to use the dual-licensing strategy long used by MySQL AB, with proprietary and GPL versions available. The antitrust of the EU had been "pressuring it to divest MySQL as a condition for approval of the merger". But, as revealed by WikiLeaks, the US Department of Justice, at the request of Oracle, pressured the EU to approve the merger unconditionally. The European Commission eventually unconditionally approved Oracle's acquisition of MySQL AB on 21 January 2010. In January 2010, before Oracle's acquisition of MySQL AB, Monty Widenius started a GPL-only fork, MariaDB. MariaDB is based on the same code base as MySQL server 5.5 and aims to maintain compatibility with Oracle-provided versions. MySQL is offered under two different editions: the open source MySQL Community Server and the proprietary Enterprise Server. MySQL Enterprise Server is differentiated by a series of proprietary extensions which install as server plugins, but otherwise shares the version numbering system and is built from the same code base. Online Data Definition Language (DDL) when using the InnoDB Storage Engine. Performance Schema that collects and aggregates statistics about server execution and query performance for monitoring purposes. A set of SQL Mode options to control runtime behavior, including a strict mode to better adhere to SQL standards. Transactions with savepoints when using the default InnoDB Storage Engine. The NDB Cluster Storage Engine also supports transactions. Synchronous replication: Multi-master replication is provided in MySQL Cluster . Native storage engines InnoDB, MyISAM, Merge, Memory (heap), Federated, Archive, CSV, Blackhole, NDB Cluster. Commit grouping, gathering multiple transactions from multiple connections together to increase the number of commits per second. The developers release minor updates of the MySQL Server approximately every two months. The sources can be obtained from MySQL's website or from MySQL's GitHub repository, both under the GPL license. When using some storage engines other than the default of InnoDB, MySQL does not comply with the full SQL standard for some of the implemented functionality, including foreign key references. Check constraints are parsed but ignored by all storage engines. Up until MySQL 5.7, triggers are limited to one per action / timing, meaning that at most one trigger can be defined to be executed after an INSERT operation, and one before INSERT on the same table. No triggers can be defined on views. MySQL database's inbuilt functions like UNIX_TIMESTAMP() will return 0 after 03:14:07 UTC on 19 January 2038. Recently, there had been an attempt to solve the problem which had been assigned to the internal queue. MySQL can be built and installed manually from source code, but it is more commonly installed from a binary package unless special customizations are required. On most Linux distributions, the package management system can download and install MySQL with minimal effort, though further configuration is often required to adjust security and optimization settings. LAMP software bundle, displayed here together with Squid. Though MySQL began as a low-end alternative to more powerful proprietary databases, it has gradually evolved to support higher-scale needs as well. It is still most commonly used in small to medium scale single-server deployments, either as a component in a LAMP-based web application or as a standalone database server. Much of MySQL's appeal originates in its relative simplicity and ease of use, which is enabled by an ecosystem of open source tools such as phpMyAdmin. In the medium range, MySQL can be scaled by deploying it on more powerful hardware, such as a multi-processor server with gigabytes of memory. There are, however, limits to how far performance can scale on a single server ('scaling up'), so on larger scales, multi-server MySQL ('scaling out') deployments are required to provide improved performance and reliability. A typical high-end configuration can include a powerful master database which handles data write operations and is replicated to multiple slaves that handle all read operations. The master server continually pushes binlog events to connected slaves so in the event of failure a slave can be promoted to become the new master, minimizing downtime. Further improvements in performance can be achieved by caching the results from database queries in memory using memcached, or breaking down a database into smaller chunks called shards which can be spread across a number of distributed server clusters. mysqldump is a logical backup tool included with both community and enterprise editions of MySQL. It supports backing up from all storage engines. MySQL Enterprise Backup is a hot backup utility included as part of the MySQL Enterprise subscription from Oracle, offering native InnoDB hot backup, as well as backup for other storage engines. XtraBackup is an open-source MySQL hot backup software program. Features include hot, non-locking backups for InnoDB storage, incremental backups, streaming, parallel-compressed backups, throttling based on the number of I/O operations per second, etc. Oracle MySQL offers a high availability solution with a mix of tools including the MySQL router and the MySQL shell. They are based on Group Replication, open source tools. In this implementation, cloud users can upload a machine image of their own with MySQL installed, or use a ready-made machine image with an optimized installation of MySQL on it, such as the one provided by Amazon EC2. A graphical user interface (GUI) is a type of interface that allows users to interact with electronic devices or programs through graphical icons and visual indicators such as secondary notation, as opposed to text-based interfaces, typed command labels or text navigation. GUIs are easier to learn than command-line interfaces (CLIs), which require commands to be typed on the keyboard. MySQL Workbench is the official integrated environment for MySQL. It was developed by MySQL AB, and enables users to graphically administer MySQL databases and visually design database structures. MySQL Workbench replaces the previous package of software, MySQL GUI Tools. Similar to other third-party packages, but still considered the authoritative MySQL front end, MySQL Workbench lets users manage database design & modeling, SQL development (replacing MySQL Query Browser) and Database administration (replacing MySQL Administrator). MySQL Workbench is available in two editions, the regular free and open source Community Edition which may be downloaded from the MySQL website, and the proprietary Standard Edition which extends and improves the feature set of the Community Edition. Adminer (formerly known as phpMinAdmin) is a free MySQL front end for managing content in MySQL databases (since version 2, it also works on PostgreSQL, MS SQL, SQLite and Oracle SQL databases). Adminer is distributed under the Apache license (or GPL v2) in the form of a single PHP file (around 300 KiB in size), and is capable of managing multiple databases, with many CSS skins available. Its author is Jakub Vrána who started to develop this tool as a light-weight alternative to phpMyAdmin, in July 2007. ClusterControl is an end-to-end MySQL management system GUI that provides the ability to deploy, monitor, manage and scale MySQL instances from a single interface. It is developed by Severalnines. The Community version of ClusterControl is free to use and let's the user deploy and monitor their MySQL instances. Advanced features like load balancing, backup & restore, failover, etc are part of a paid offering. Database Workbench is a software application for development and administration of multiple relational databases using SQL, with interoperationality between different database systems, developed by Upscene Productions. Because Databases Workbench supports multiple database systems, it can provide software developers with the same interface and development environment for these otherwise different database systems and also includes cross database tools. Database Workbench supports the following relational databases: Oracle Database, Microsoft SQL Server, SQL Anywhere, Firebird, NexusDB, InterBase, MySQL and MariaDB. Database Workbench 5 runs on 32-bit or 64 bit Windows platforms. Under Linux, FreeBSD or macOS Database Workbench can operate using Wine. DBeaver is an SQL client and a database administration tool. DBeaver includes extended support of following databases: MySQL and MariaDB, PostgreSQL, Oracle, DB2 (LUW), EXASOL, SQL Server, Sybase, Firebird, Teradata, Vertica, Apache Phoenix, Netezza, Informix, Apache Derby, Apache Phoenix, H2, SQLite and any other database which has JDBC or ODBC driver. DBeaver is free and open source software that is distributed under the Apache License 2.0. The source code is hosted on GitHub. DBEdit is a database editor, which can connect to an Oracle, DB2, MySQL and any database that provides a JDBC driver. It runs on Windows, Linux and Solaris. DBEdit is free and open source software and distributed under the GNU General Public License. The source code is hosted on SourceForge. HeidiSQL, previously known as MySQL-Front, is a free and open source client, or frontend for MySQL (and for its forks like MariaDB and Percona Server), Microsoft SQL Server and PostgreSQL. HeidiSQL is developed by German programmer Ansgar Becker and a few other contributors in Delphi. To manage databases with HeidiSQL, users must login to a local or remote MySQL server with acceptable credentials, creating a session. Within this session users may manage MySQL Databases within the connected MySQL server, disconnecting from the server when done. Its feature set is sufficient for most common and advanced database, table and data record operations but remains in active development to move towards the full functionality expected in a MySQL Frontend. Navicat is a series of graphical database management and development software produced by PremiumSoft CyberTech Ltd. for MySQL, MariaDB, Oracle, SQLite, PostgreSQL and Microsoft SQL Server. It has an Explorer-like graphical user interface and supports multiple database connections for local and remote databases. Its design is made to meet the needs of a variety of audiences, from database administrators and programmers to various businesses/companies that serve clients and share information with partners. 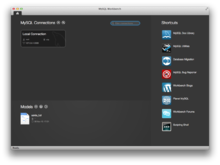 Navicat is a cross-platform tool and works on Microsoft Windows, OS X and Linux platforms. Upon purchase, users are able to select a language for the software from eight available languages: English, French, German, Spanish, Japanese, Polish, Simplified Chinese and Traditional Chinese. OpenOffice.org Base is freely available and can manage MySQL databases if the entire suite is installed. phpMyAdmin is a free and open source tool written in PHP intended to handle the administration of MySQL with the use of a web browser. It can perform various tasks such as creating, modifying or deleting databases, tables, fields or rows; executing SQL statements; or managing users and permissions. The software, which is available in 78 languages, is maintained by The phpMyAdmin Project. It can import data from CSV and SQL, and transform stored data into any format using a set of predefined functions, like displaying BLOB-data as images or download-links. Sequel Pro is a free and open-source MacOS application for working with MySQL databases locally or remotely. It uses the freemium model, where the Gratis users are actually getting features to most of the basic services. It takes a SQL Table itself to manage these requests. It can handle the new "fun" UTF-8 features for newer unicode as well as having multiple GB tables without issue. Sourceforge is its home. SQLBuddy is an open-source web-based application written in PHP intended to handle the administration of MySQL and SQLite with the use of a Web browser. The project places an emphasis on ease of installation and a simple user interface. SQLyog is a GUI tool available in free as well as paid versions. Data manipulations (e.g., insert, update, and delete) may be done from a spreadsheet-like interface. Its editor has syntax highlighting and various automatic formatting options. Both raw table data and a result set from a query can be manipulated. Its data search feature uses Google-like search syntax and translates to SQL transparently for the user. It has a backup tool for performing unattended backups. Backups may be compressed and optionally stored as a file-per-table as well as identified with a timestamp. Toad for MySQL is a software application from Dell Software that database developers, database administrators and data analysts use to manage both relational and non-relational databases using SQL. Toad supports many databases and environments. It runs on all 32-bit/64-bit Windows platforms, including Microsoft Windows Server, Windows XP, Windows Vista, Windows 7 and 8 (32-Bit or 64-Bit). Dell Software has also released a Toad Mac Edition. Dell provides Toad in commercial and trial/freeware versions. The freeware version is available from the ToadWorld.com community. Webmin is largely based on Perl, running as its own process and web server. 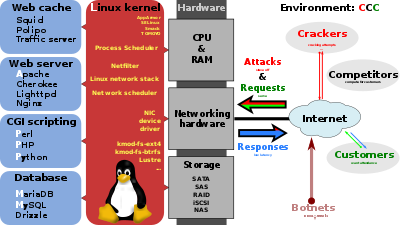 It defaults to TCP port 10000 for communicating, and can be configured to use SSL if OpenSSL is installed with additional required Perl Modules. It is built around modules, which have an interface to the configuration files and the Webmin server. This makes it easy to add new functionality. Due to Webmin's modular design, it is possible for anyone who is interested to write plugins for desktop configuration. Webmin also allows for controlling many machines through a single interface, or seamless login on other webmin hosts on the same subnet or LAN. A command-line interface is a means of interacting with a computer program where the user issues commands to the program by typing in successive lines of text (command lines). MySQL ships with many command line tools, from which the main interface is the mysql client. MySQL Utilities is a set of utilities designed to perform common maintenance and administrative tasks. Originally included as part of the MySQL Workbench, the utilities are a stand-alone download available from Oracle. Percona Toolkit is a cross-platform toolkit for MySQL, developed in Perl. Percona Toolkit can be used to prove replication is working correctly, fix corrupted data, automate repetitive tasks, and speed up servers. Percona Toolkit is included with several Linux distributions such as CentOS and Debian, and packages are available for Fedora and Ubuntu as well. Percona Toolkit was originally developed as Maatkit, but as of late 2011, Maatkit is no longer developed. Many programming languages with language-specific APIs include libraries for accessing MySQL databases. These include MySQL Connector/Net for integration with Microsoft's Visual Studio (languages such as C# and VB are most commonly used) and the JDBC driver for Java. In addition, an ODBC interface called MySQL Connector/ODBC allows additional programming languages that support the ODBC interface to communicate with a MySQL database, such as ASP or ColdFusion. The HTSQL – URL-based query method also ships with a MySQL adapter, allowing direct interaction between a MySQL database and any web client via structured URLs. Other drivers exists for languages like Python or Node.js. A variety of MySQL forks exist, including the following. MariaDB is a community-developed fork of the MySQL relational database management system intended to remain free under the GNU GPL. Being a fork of a leading open source software system, it is notable for being led by the original developers of MySQL, who forked it due to concerns over its acquisition by Oracle. Contributors are required to share their copyright with the MariaDB Foundation. MariaDB intends to maintain high compatibility with MySQL, ensuring a "drop-in" replacement capability with library binary equivalency and exact matching with MySQL APIs and commands. There are some documented differences and incompatibilities between versions of MySQL and MariaDB, however, and some tools for interacting with MySQL, such as the MySQL Workbench, are not fully compatible with MariaDB. It includes the XtraDB storage engine for replacing InnoDB, as well as a new storage engine, Aria, that intends to be both a transactional and non-transactional engine perhaps even included in future versions of MySQL. Percona Server for MySQL, forked by Percona, aims to retain close compatibility to the official MySQL releases, while focusing on performance and increased visibility into server operations. Also included in Percona Server for MySQL is XtraDB, Percona's fork of the InnoDB Storage Engine. Percona freely includes a number of scalability, availability, security and backup features only available in MySQL's commercial Enterprise edition. Drizzle was a free software/open source relational database management system (DBMS) that was forked from the now-defunct 6.0 development branch of the MySQL DBMS. Like MySQL, Drizzle had a client/server architecture and uses SQL as its primary command language. Drizzle was distributed under version 2 and 3 of the GNU General Public License (GPL) with portions, including the protocol drivers and replication messaging under the BSD license. WebScaleSQL was a software branch of MySQL 5.6, and was announced on 27 March 2014 by Facebook, Google, LinkedIn and Twitter as a joint effort to provide a centralized development structure for extending MySQL with new features specific to its large-scale deployments, such as building large replicated databases running on server farms. Thus, WebScaleSQL opened a path toward deduplicating the efforts each company had been putting into maintaining its own branch of MySQL, and toward bringing together more developers. By combining the efforts of these companies and incorporating various changes and new features into MySQL, WebScaleSQL aimed at supporting the deployment of MySQL in large-scale environments. The project's source code is licensed under version 2 of the GNU General Public License, and is hosted on GitHub. ^ Initially, it was a MyISAM-only feature; supported by InnoDB since the release of MySQL 5.6. ^ Prior to MySQL 5.5.3, UTF-8 and UCS-2 encoded strings are limited to the BMP; MySQL 5.5.3 and later use utf8mb4 for full unicode support. ^ In MySQL 5.0, storage engines must be compiled in; since MySQL 5.1, storage engines can be dynamically loaded at run time. ^ "MySQL 8.0 Release Notes". mysql.com. Retrieved 2 February 2019. ^ "MySQL: Project Summary". Ohloh. Black Duck Software. Retrieved 17 September 2012. ^ "Supported Platforms: MySQL Database". Oracle. Retrieved 24 March 2014. ^ "Downloads". MySQL. Retrieved 3 August 2014. ^ "DB-Engines Ranking". Retrieved 12 February 2015. ^ "History of MySQL". MySQL 5.1 Reference Manual. MySQL AB. Retrieved 26 August 2011. ^ "Sun Microsystems Announces Completion of MySQL Acquisition; Paves Way for Secure, Open Source Platform to Power the Network Economy" (Press release). Sun Microsystems. 26 February 2008. Archived from the original on 28 February 2008. Retrieved 17 September 2012. ^ Sobel, Jason (21 December 2007). "Keeping Up". The Facebook Blog. Facebook. Retrieved 30 October 2008. ^ Malik, Om (25 April 2008). "Facebook's Insatiable Hunger for Hardware". GigaOM. GigaOmniMedia. Retrieved 30 October 2008. ^ Cole, Jeremy (14 April 2011). Big and Small Data at @Twitter. YouTube. Google. Retrieved 20 October 2011. ^ "MySQL Customer: Flickr". MySQL Customers. Oracle. Retrieved 17 September 2012. ^ "MySQL Customer: YouTube". MySQL Customers. Oracle. Retrieved 17 September 2012. ^ "MySQL Internals Manual". Dev.mysql.com. 4 March 2009. Retrieved 8 June 2009. ^ "MySQL for OpenVMS". vmsmysql.org. 30 March 2011. Retrieved 16 January 2014. ^ "Oracle :: MySQL Open Source License". Mysql.com. Retrieved 8 June 2009. ^ "Oracle :: MySQL Commercial License". Mysql.com. Retrieved 8 June 2009. ^ "Five Questions With Michael Widenius – Founder And Original Developer of MySQL". www.opensourcereleasefeed.com. Archived from the original on 13 March 2009. Retrieved 13 October 2012. ^ "MySQL 3.23 Declared Stable". Archived from the original on 15 August 2001. ^ "Capttofu: FederatedX Pluggable Storage Engine Released!". Capttofu.livejournal.com. Archived from the original on 13 August 2011. Retrieved 3 April 2009. ^ "MySQL Federated Tables: The Missing Manual". O’Reilly Media. 8 October 2006. Retrieved 1 February 2012. ^ "Sun Picks Up MySQL For $1 Billion; Open Source Is A Legitimate Business Model". Retrieved 13 October 2012. ^ "Archives – Oops, we did it again (MySQL 5.1 released as GA with crashing bugs)". Planet MySQL. 29 November 2008. Archived from the original on 30 December 2008. Retrieved 5 February 2013. ^ "TPC-H Run on MySQL 5.1 and 6.0 | MySQL Performance Blog". MySQL Performance Blog. Retrieved 8 June 2009. ^ "Oracle Completes Acquisition of Sun" (Press release). Oracle. 27 January 2010. Retrieved 1 February 2012. ^ "Overview and Frequently Asked Questions" (PDF). ^ "Oracle's ambitious plans for integrating Sun's technology". InfoWorld. 27 January 2010. ^ a b "Dead database walking: MySQL's creator on why the future belongs to MariaDB". Computerworld. 28 March 2013. Retrieved 11 September 2013. ^ "InnoDB I/O Subsystem Changes". dev.mysql.com. Archived from the original on 10 February 2012. Retrieved 1 February 2012. ^ "Scalability Improvements". dev.mysql.com. Archived from the original on 10 February 2012. Retrieved 1 February 2012. ^ "MySQL Lists: packagers: MySQL 6.0.11 Alpha has been released!". Lists.mysql.com. Retrieved 1 February 2012. ^ "What's New in MySQL 5.6". MySQL Developer Zone. Archived from the original on 23 April 2011. Retrieved 21 April 2011. ^ "Oracle Announces General Availability of MySQL 5.7". Oracle. Retrieved 1 November 2015. ^ "8.0.0-dmr (Milestone Release)". Retrieved 12 September 2016. ^ "A.1 MySQL 5.1 FAQ: General". docs.oracle.com. Retrieved 2 August 2017. ^ "MySQL 5.1 Release Notes". docs.oracle.com. Retrieved 2 August 2017. ^ "MySQL: MySQL 5.5 Release Notes". dev.mysql.com. Retrieved 15 January 2018. ^ "MySQL: MySQL 5.6 Release Notes". dev.mysql.com. Retrieved 15 January 2018. ^ "MySQL: MySQL 5.7 Release Notes". dev.mysql.com. Retrieved 15 January 2018. ^ "Mysql: Mysql 8.0 Release". ^ "MySQL: MySQL 8.0 Release Notes". dev.mysql.com. Retrieved 2 February 2019. ^ "MySQL 8 is coming". opensource.com. Retrieved 27 April 2018. ^ Basil, Tom (4 September 2001). "Eyewitness account: "Monty Widenius, International Fugitive"". MySQL Life (Mailing list). Archived from the original on 4 October 2013. Retrieved 16 September 2012. ^ "FAQ on MySQL vs. NuSphere Dispute". MySQL AB. 13 July 2001. Archived from the original on 17 July 2001. Retrieved 16 September 2012. ^ "Affidavit of Eben Moglen on Progress Software vs. MySQL AB Preliminary Injunction Hearing". Archived from the original on 7 February 2005. ^ Progress Software Corporation v. MySQL AB , 195 F. Supp. 2d 328 (D. Mass. 2002). ^ "Judge Saris defers GNU GPL Questions for Trial in MySQL vs. Progress Software" (Press release). Free Software Foundation. 1 March 2002. Retrieved 16 September 2012. ^ "Oracle Announces the Acquisition of Open Source Software Company, Innobase" (Press release). Oracle. 7 October 2005. Archived from the original on 20 July 2011. Retrieved 16 September 2012. ^ "MySQL to Promote New Open Source DB Engines from its Partners and Dev Community" (Press release). MySQL AB. 26 April 2006. Archived from the original on 23 June 2011. Retrieved 16 September 2012. ^ Babcock, Charles (14 February 2006). "Oracle Buys Sleepycat, Is JBoss Next?". InformationWeek. CPM Media. Retrieved 16 September 2012. ^ "Changes in MySQL 5.1.12". MySQL 5.1 Reference Manual. MySQL AB. 24 October 2006. Archived from the original on 20 October 2012. Retrieved 16 September 2012. ^ "Sun Microsystems Announces Agreement to Acquire MySQL, Developer of the World's Most Popular Open Source Database" (Press release). Sun Microsystems. 16 January 2008. Archived from the original on 18 July 2011. Retrieved 16 September 2012. ^ "Oracle to Buy Sun" (Press release). Sun Microsystems. 20 April 2009. Archived from the original on 22 April 2009. Retrieved 16 September 2012. ^ Whitney, Lance (14 December 2009). "Oracle pledges to play well with MySQL". CNET. Retrieved 16 September 2012. ^ Michael, Widenius (12 December 2009). "Help saving MySQL". Monty Says. Google. Retrieved 16 September 2012. ^ "The Software Freedom Law Center Submits an Opinion on the Oracle/Sun Merger to the EC". www.softwarefreedom.org. Software Freedom Law Center. 4 December 2009. Retrieved 1 February 2018. ^ Lai, Eric (28 October 2009). "Many open-sourcers back an Oracle takeover of MySQL". www.infoworld.com. InfoWorld. Retrieved 1 February 2018. ^ Wildeboer, Jan (5 January 2010). "Why I will not sign the MySQL petition". jan.wildeboer.net. Retrieved 1 February 2018. ^ Kanaracus, Chris (30 August 2011). "Wikileaks Cable Offers New Insights Into Oracle-Sun Deal". PC World. Retrieved 16 September 2012. ^ "Mergers: Commission clears Oracle's proposed acquisition of Sun Microsystems" (Press release). European Union. 21 January 2010. Retrieved 16 September 2012. ^ "MariaDB versus MySQL – Compatibility". AskMonty Knowledgebase. Monty Program. 30 July 2010. Archived from the original on 27 July 2010. Retrieved 16 September 2012. ^ "Which Should I Use: MySQL Enterprise or MySQL Community Server?". MySQL AB. Archived from the original on 9 April 2009. Retrieved 8 April 2009. ^ Guy Harrison; Steven Feuerstein (2008). MySQL Stored Procedure Programming. O'Reilly Media. p. 49. ISBN 978-0-596-10089-6. ^ "Monitoring RDS MySQL performance metrics". Datadog. 20 October 2015. Retrieved 14 December 2015. ^ "MySQL :: InnoDB 1.1 for MySQL 5.5 User's Guide :: C InnoDB Glossary :: ACID". Archived from the original on 25 December 2010. Retrieved 5 January 2011. ^ "MariaDB Replication". MariaDB KnowledgeBase. Retrieved 9 March 2019. ^ "MySQL :: MySQL 5.7 Reference Manual :: 16.1.4 MySQL Multi-Source Replication". dev.mysql.com. Retrieved 9 March 2019. ^ "MySQL :: MySQL 5.7 Reference Manual :: 16.3.9 Semisynchronous Replication". dev.mysql.com. Retrieved 9 March 2019. ^ "Semisynchronous Replication". MariaDB KnowledgeBase. Retrieved 9 March 2019. ^ "MySQL Cluster Replication: Multi-Master and Circular Replication". MySQL. ^ "MySQL University: MySQL Galera Multi-Master Replication". Oracle Corporation. 9 February 2010. ^ "MySQL :: MySQL 8.0 Reference Manual :: 18 Group Replication". dev.mysql.com. Retrieved 9 March 2019. ^ "InnoDB and FOREIGN KEY Constraints". MySQL. Retrieved 11 April 2015. ^ "Bug #3464 Constraints: support CHECK". MySQL. 14 April 2004. Retrieved 11 April 2015. ^ "MySQL 8.0 Reference Manual: CREATE TABLE Syntax". MySQL Reference Manual. Oracle. Retrieved 7 May 2018. ^ a b "CREATE TRIGGER Syntax". MySQL. Retrieved 11 April 2015. ^ "MySQL Bugs: #12654: 64-bit unix timestamp is not supported in MySQL functions". MySQL. 18 August 2005. Retrieved 6 October 2017. ^ "Allow dates beyond 2038 by dveeden · Pull Request #130 · mysql/mysql-server". GitHub, Inc. 22 March 2017. Retrieved 6 October 2017. ^ "The future of replication in MySQL". Facebook. Retrieved 9 December 2009. ^ "Database Sharding". Code Futures. Archived from the original on 16 January 2010. Retrieved 9 December 2009. ^ "XtraBackup". Percona. Retrieved 19 January 2013. ^ "MySQL :: MySQL Enterprise High Availability". www.mysql.com. Retrieved 9 March 2019. ^ "High Availability & Performance Tuning". MariaDB KnowledgeBase. Retrieved 9 March 2019. ^ "Running MySQL on Amazon EC2 with EBS (Elastic Block Store)". Amazon Web Services. Retrieved 5 February 2013. ^ Finley, Klint. "7 Cloud-Based Database Services". ReadWriteWeb. Archived from the original on 9 November 2011. Retrieved 9 November 2011. ^ "LibreOffice Base". Archived from the original on 7 January 2012. Retrieved 5 January 2012. ^ "Translations". phpMyAdmin. Retrieved 23 December 2014. ^ "Team". phpMyAdmin. Retrieved 3 March 2013. ^ Home. "Percona Toolkit for MySQL". Percona. Retrieved 26 March 2014. ^ "MySQL :: Download MySQL Shell". dev.mysql.com. Retrieved 9 March 2019. ^ "MySQL :: Download Connector/Python". dev.mysql.com. Retrieved 9 March 2019. ^ "MySQL :: Download Connector/Node.js". dev.mysql.com. Retrieved 9 March 2019. ^ "Contributing Code". MariaDB KnowledgeBase. Retrieved 17 September 2014. ^ a b "MariaDB versus MySQL - Compatibility". MariaDB KnowledgeBase. Retrieved 16 September 2016. ^ "Monitoring MySQL performance metrics". Datadog. Retrieved 16 September 2016. ^ "About XtraDB". MariaDB KnowledgeBase. Retrieved 16 September 2016. ^ "Aria FAQ". MariaDB KnowledgeBase. Retrieved 16 September 2016. ^ Percona Server Frequently Asked Questions, How is it related to other MySQL forks? ^ "Percona challenges Oracle with alternate MySQL release". PC World. Retrieved 12 February 2015. ^ Clark, Jack (17 March 2011). "MySQL fork Drizzle gets general release". ZDNet. Retrieved 3 January 2016. ^ Steven J. Vaughan-Nichols (28 March 2013). "WebScaleSQL: MySQL for Facebook-sized databases". ZDNet. Retrieved 1 April 2014. ^ Klint Finley (27 March 2013). "Google and Facebook Team Up to Modernize Old-School Databases". Wired. Retrieved 1 April 2014. ^ Jack Clark (27 March 2013). "Forkin' 'L! Facebook, Google and friends create WebScaleSQL from MySQL 5.6". The Register. Retrieved 1 April 2014. ^ "Frequently Asked Questions". webscalesql.org. 27 March 2014. Retrieved 1 April 2014. Wikimedia Commons has media related to MySQL. Axmark, David (21 March 2008). "MySQL co-founder, David Axmark, on Sun's billion dollar acquisition" (video). intruders.tv.